I am pleased to announce duo exhibition with Wojciech Antoni Sobczynski in Mag Gallery in Krakow. 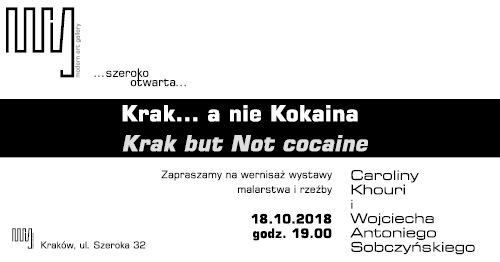 ‘Krak but not cocaine’ exhibition presents the latest artworks of London based artists – Wojciech Antoni Sobczynski and Carolina Khouri. The aim of the show is to demonstrate their current artistic practice, the evolution of style and technique as a result of undertaken experiments. In addition the show is a manifestation of their respective creative freedom and openness to challenges. The title of the exhibition relates to the name of legendary founder of Krakow. As a sound the word ‘Krak’ resembles the name of cocaine variety in a popular language. The convergence of these words is a provocative game of words. It is intended as a metaphor of collision between tradition and contemporary reality. Wojciech Antoni Sobczynski presents sculptures, paintings, 3D objects. Some of them were created specifically for this exhibition, which has a distinctly special meaning for him. It is his first exhibition in Krakow since students’ days at Fine Art Academy and leaving Poland in 1968. The show has a symbolic meaning of a return to one’s roots and fundaments of what is called ‘home’. Carolina Khouri’s artworks are part of the series ‘Landscape of my mind’, which has began in 2011. The series contains paintings in which a tradition of abstract expressionism is present. Her art is characterised by vivid and bold colours. She contrasts minimalist character of composition and controlled smooth surface with a buoyant architecture of impasto. 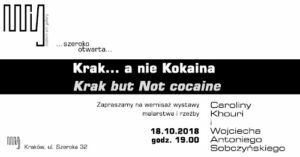 ‘Krak but not cocaine’ is the third joint exhibition of these two artists, whose art is created in the space they share in life and in art interchangeably. Their previous exhibitions in Poland took place in Galeria Bielska (BWA) with the show ‘Squaring the Circle’ by London based art group ‘Page 6’ and in the Centre of Contemporary Art in Torun, with the exhibition ‘RadioCreativity’.